Result and final standings from the last day of competition at the 2018 Australian Under-14 Boys Club Championships being held in Kilsyth, Victoria. Achieving an incredible feat, the Eltham Wildcats have backed up their 2017 gold medal with a victory over Nunawading Spectres in this year's final to claim their second consecutive Championship. 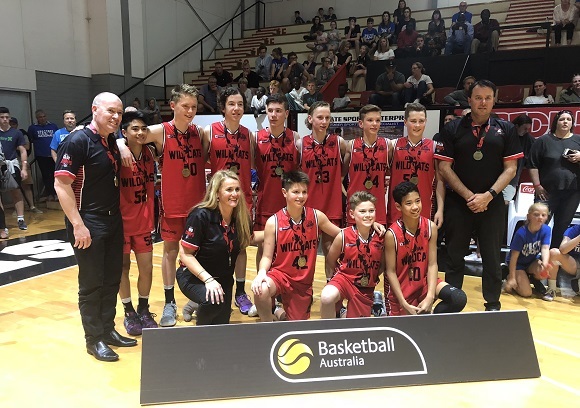 The Wildcats were made to fight until the final siren for the victory as Nunawading began the gold medal game the same way they had started the Semi-Final. Jumping out to a 12-1 lead, the Spectres had their hundreds of fans in the stands on their feet and while Eltham were able to settle things down before quarter-time, they still trailed by 12 points at the first break. The margin stayed in double-digits to half-time but a three-pointer to close the second term from Emett Wise (17 points) gave the Wildcats some momentum and they trimmed the deficit to seven halfway through the third. Kristian Ferronato (15 points), the only returning player from Eltham's 2017 Championship, then took over with five points in three minutes while Felix Bell (eight points) hit two big shots as the pressure began to mount on the Spectres. With their section of the crowd now raucous, the Wildcats were buoyed to a four-point edge at three-quarter time and they then pushed that out to nine with two minutes remaining. Tristan Devers (34 points) threatened to produce one final twist as he scored six straight points in the game but time was as much Nunawading's enemy as the Wildcats were and Mitchell Feronato (eight points) was able to seal the 65-59 win from the free-throw line. The Championship Division bronze medal game was an arm-wrestle throughout the first half but the Illawarra Hawks finally gained some breathing space halfway through the third with a five-point lead. Joshua Dent (17 points) looked to have seized control for his side but Isaac Ayoubi (15 points) and Anthony Mundine (13 points) brought the Sydney Comets back into it. Their full-court pressure eventually got to the Hawks and they helped put the Comets in front on the back of a 13-1 run. Just when it looked like Sydney were going to cruise to victory, Tobias Delaney (ten points) came up big with consecutive three-pointers. Dent then had a chance from beyond half-court on the buzzer to force overtime but the Comets were able to hang on and back up their silver medal from last year with a bronze. There was another close game involving the home team Kilsyth Cobras as they fell to the Bulleen Boomers, 54-57. Wyatt Stewart led the charge for the Cobras with 20 points but in the end, Bulleen had ten players hit the scoreboard and three reach double-figures as their impressive team performance led them to the win. Warrnambool Seahawks were also locked in a fierce battle with Blacktown West Storm on the final day of competition, leading by just a point with 3:15 remaining. They were unable to score again from that point on though with the Storm finishing the contest on a 12-0 run to earn fifth place. James Oconer (18 points) paced his side, helping to negate the influence of tournament leading scorer, George Stevens (26 points). In the Shield Division, Brisbane Capitals shared the load with eight players scoring six or more points and they also doubled Norwood Flames from beyond the arc as they controlled their gold medal game to prevail 58-35. The bronze medal game was a heart-stopper between the South West Slammers and Canberra Gunners. The boys from the nation's capital led by double-digits midway through the third quarter but the Slammers put together a massive push prior to three-quarter time led by Malachai Bell (24 points) and Dyllan Catalano (eight points). Cooper Zanich also chimed in with two big three's and the Slammers had all the momentum heading down the stretch but William Goodwin (13 points) responded with six points in a row for Canberra to tie things up on the final possession. The Slammers had the ball though and they were able to find Charles Sissoev who hit the game-winning floater to clinch the Shield bronze medal for his team. For all the draws, results and stats, click here.